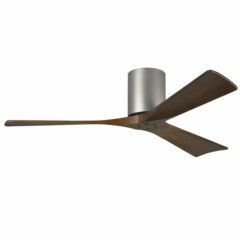 Atlas Irene-3 Hugger Ceiling Fan with Remote Control - Textured Bronze 52"
The energy efficient Irene 3 Ceiling Fan now comes in a low profile version, maintaining its unique, minimal design to suit those spaces with a lower ceiling height. It has 6 available speed options to control the airflow of the fan and reversible from the remote are settings for both summer and winter use. 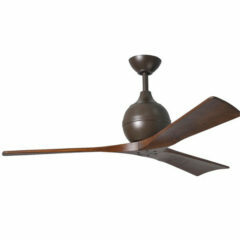 This fan is ‘damp rated’ and is suitable to be installed outdoors in a covered location. The Atlas Irene-3 now comes in a low profile “hugger” model! It has an ultra-quiet energy efficient, reversible, DC motor and comes with a 6 speed remote control that can either be hand-held or wall mounted. 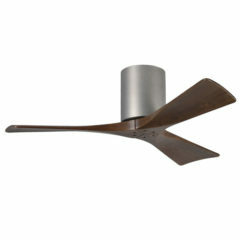 The fan is constructed out of cast aluminium and heavy stamped steel. 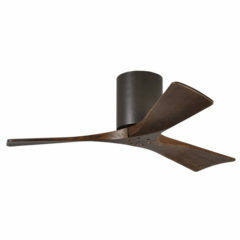 With an architectural design the Irene has 3 solid wood, walnut-stained, machine-cut blades. This low profile model is suitable for use on flat ceilings only and can be installed both indoors and in outdoor, undercover areas. This Atlas Irene 3 fan is great for both indoor and outdoor, undercover installations. This fan is available in three sizes (42″, 52″ and 60″) and two different colours including Textured Bronze and Brushed Nickel, both with walnut-stained wooden blades. Each size and colour variation is listed separately. 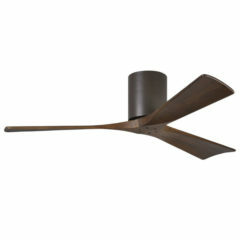 This listing is for the 52″ Textured Bronze “Hugger” model with 3 blades. Please Note: The Irene-3 is suitable for ceilings 2.7m and higher as it drops approximately 53cm from ceiling to blade. 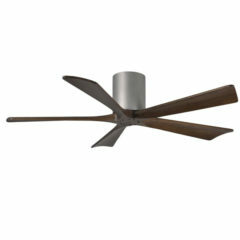 The energy efficient Irene 3 Ceiling Fan now comes with an energy efficient DC motor and a 6 speed remote control. 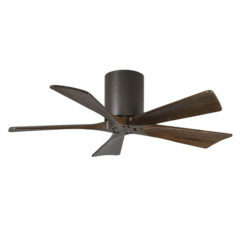 This fan is ‘damp rated’ and is suitable to be installed outdoors in a covered location. Its unique design would make it the perfect fit for both modern and the more traditional styled interiors. 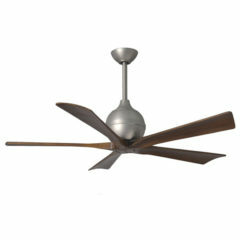 The energy efficient Irene 3 Ceiling Fan now comes with 6 speed remote control. 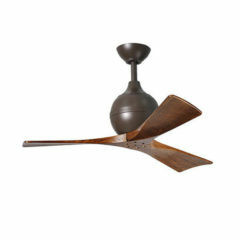 This fan is ‘damp rated’ and is suitable to be installed outdoors in a covered location. Its unique design would make it the perfect fit for both modern and the more traditional styled interiors. Please Note: The Irene-5 is suitable for ceilings 2.7m and higher as it drops approximately 53cm from ceiling to blade. The energy efficient Irene 5 Ceiling Fan has a unique design with five walnut blades which would complement your modern space or traditional decor. It comes with a 6 speed remote control and is damp rated making it suitable to be installed both indoors and in an outdoor, undercover location. 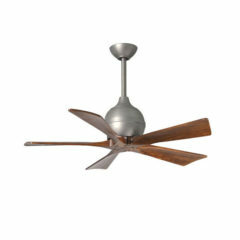 The energy efficient Irene 3 Ceiling Fan now comes with 6 speed remote control. 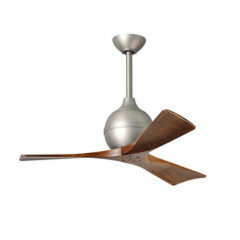 This fan is ‘damp rated’ and is suitable to be installed outdoors in a covered location. 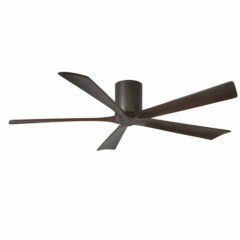 This models small 42″ blade span makes it ideal for those smaller rooms where space is quite limited. The energy efficient Irene 3 Ceiling Fan now comes with 6 speed remote control. This fan is ‘damp rated’ and is suitable to be installed outdoors in a covered location particularly in larger spaces with a 60″ blade span. Its unique design would make it the perfect fit for both modern and the more traditional styled interiors. 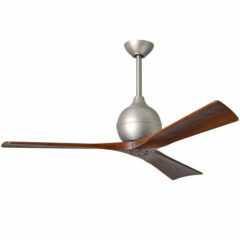 The energy efficient Irene 5 Ceiling Fan has a unique design with five walnut blades which would complement your modern space or traditional decor. It comes with a 6 speed remote control and is damp rated making it suitable to be installed both indoors and in an outdoor, undercover location particularly in larger spaces with its 60″ blade span. 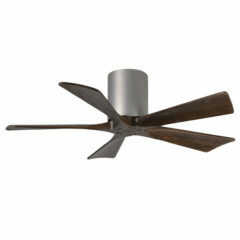 The energy efficient Irene 5 Ceiling Fan now comes in a low profile version, maintaining its unique, minimal design to suit those spaces with a lower ceiling height. It has 6 available speed options to control the airflow of the fan and reversible from the remote are settings for both summer and winter use. 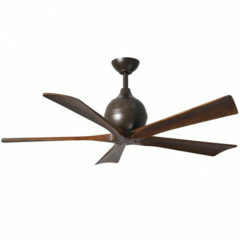 This fan is 'damp rated' and is suitable to be installed outdoors in a covered location. The energy efficient Irene 5 Ceiling Fan now comes in a low profile version, maintaining its unique, minimal design to suit those spaces with a lower ceiling height. It has 6 available speed options to control the airflow of the fan and reversible from the remote are settings for both summer and winter use. 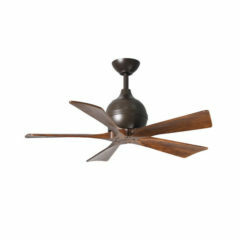 This fan is ‘damp rated’ and is suitable to be installed outdoors in a covered location.